Startup Monday is ABCey’s weekly post that showcases some of the best and most innovative startups based in the San Francisco Bay Area! These are often companies that we have our eye on or have worked with in the past. This week, the spotlight’s on Modsy – the company who wants to revolutionize the way we decorate our homes! 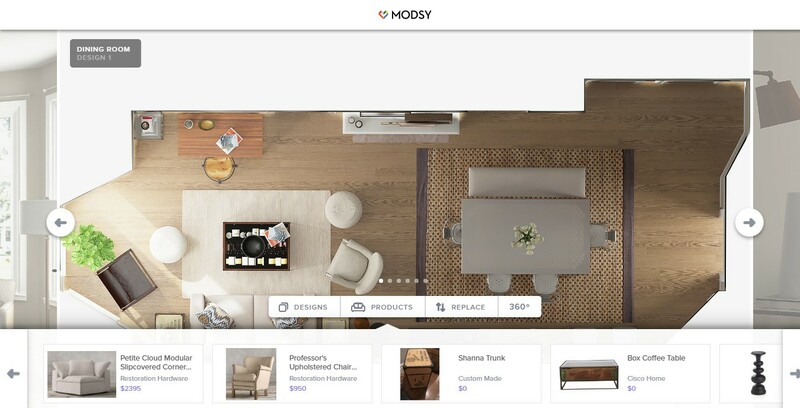 Founded in 2015, Modsy was designed to tackle a common problem: how will you know if the furniture you buy looks good in your house? If you’ve ever furnished or redecorated a house, you know it is a huge feat and involves tons of guesswork. Modsy wanted to make home design fun and easy to cut down all the trips to the furniture store. How? By letting their customers “try on” furniture! If you’ve ever played The Sims, you’re going to love this! First, you snap a couple pictures of your space and include the measurements, and Modsy will create a 3D model of your space. Then, their team will create a personalized room design based on your vision, budget, and layout needs. If you’re not the biggest fan of the furniture, not to fret! Here’s where your personal touch comes in: you are able to swap out furniture to your liking. If you are head-over-heels in love with the customized design, you can also buy the furniture directly from the layout! There goes the trips to the furniture store out the window! We love Modsy because decorating our homes used to be a process that entails nail-biting, stressful guesswork in the middle of a showroom! We can see how experts would design our space and also switch elements out for a personal touch! As event planners, we would love to to see if it could use it to design spaces for events! It could be a fun way to try out new designs. Will you use Modsy? Have you worked with them before? We’d love to hear from you! Let us know in the comments below or on Facebook and Twitter! If you’d like to see other San Francisco startups we’ve featured before, click here.